How to update LG G6 to official Android 8.0 Oreo firmware update using LGUP? 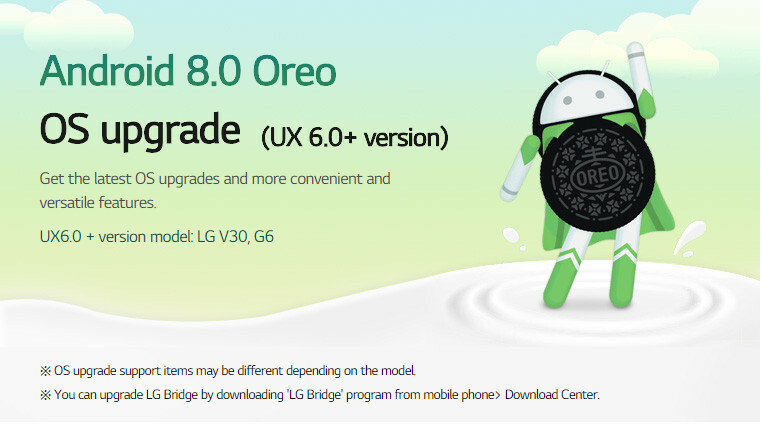 2 Comments on How to update LG G6 to official Android 8.0 Oreo firmware update using LGUP? Update: LG G6 Oreo for the European Open variants H870 is now available for download with firmware build number H87020a in the form of KDZ file format. LG is now rolling out official Android 8.0 Oreo for its previous flagship LG G6. We have already posted about the LG V30 receiving the Oreo firmware update for all of its variants. Now, some of the variants of LG G6 have started receiving the same OTA update. These variants include the Korean G6 model (G600L) and the Canadian model (H873) as well. So go to Settings > System updates > and check for any OTA update notifications. If not, then you can seek the full stock KDZ firmware files from below and flash it using the upgraded LGUP flashtool. Other variants of LG G6 and G6+ such as H870 (Europe); H871 (AT&T); H872 (T-Mobile); H873 (Canada); H870K (Australia); LS993 (Sprint); US997 (U.S. Cellular); VS988 (Verizon Wireless) will soon start receiving Oreo OTA update. The new Oreo firmware comes with a new build number H87320c for the Canadian variant. It also features the March 2018 Android Security Patch and all the Oreo goodies. 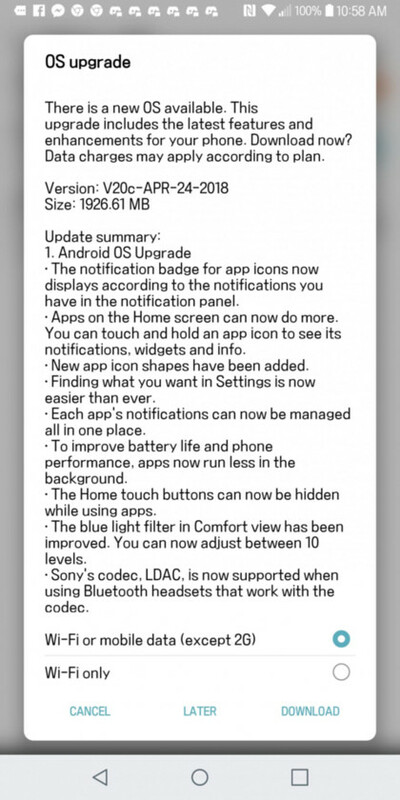 Most importantly, it brings the new LG UX 6.0. Unfortunately, the global variant H870 has not received any Android 8.0 Oreo OTA. However, there are ways to update the LG G6 H870 and other variants using an Oreo ROM port. We have listed multiple ways to update a variety of LG G6 device to Oreo right now. The KDZ is currently only available for the Canadian and Korean variants. For the international or European variants, see below. The above KDZ can be easily flashed on the LG G6 using Uppercut for LGUP flashtool. You can also use the LG Bridge Read this full tutorial on updating LG V30 using Uppercut for LGUP. How to update LG G6 H870 to Android 8.0 using Oreo ROM port? This is an Oreo port created from the official Android 8.0 KDZ. Apaer from this, it has several features such as it is based of the stock KDZ firmware LG-H870 OPEN EU 11G ROM. It also has stock Build.prop, the ROM is non-rooted, boot.img has been modified to keep TWRP recovery, removed dm-verity, and remove force encryption as well. Your LG G6 must have an Unlocked Bootloader. Visit this LG developer website and then visit our How to do. Ensure that your LG G6 is rooted with latest official TWRP recovery installed. If you need root access, you can either flash the latest SuperSU or Magisk via TWRP. Download LG G6 H870 11G OPEN EU (TWRP) zip from here. Transfer it to external SD card or internal storage. Now reboot into TWRP recovery using button combo or reboot app. From recovery, hit Backup option and take a full Nandroid backup including partitions such as EFS, Dalvik, ART, Cache, System & Data, and Boot. Now format or factory reset from TWRP. Wipe Dalvik/ART, Cache, System and Data. Now tap on install and flash H870 11G OPEN EU (TWRP) zip. Flash SuperSU or Magisk zip when you need root. Enjoy your Oreo ROM on your LG G6 device. How to update the T-Mobile version H872?